Diaphragm Pump Systems | EGM, LLC. Whether the requirements are centered on digital dosing, aggressive media, high pressure applications, or cost-effective chemical injection, EGM can design, configure, properly accessorize, and construct diaphragm pump systems for reliable performance. With OEM access to the world’s most trusted and reputable brands, EGM can incorporate a wide range of diaphragm metering pumps into single or multi-pump skid units. Systems can be built to reside on TIG welded stainless steel skid frames, UV and weather resistant thermoplastic bases, or enclosed in tote-mountable thermoplastic boxes. Control options can range from manual control to timer panels to fully automated flow loops. 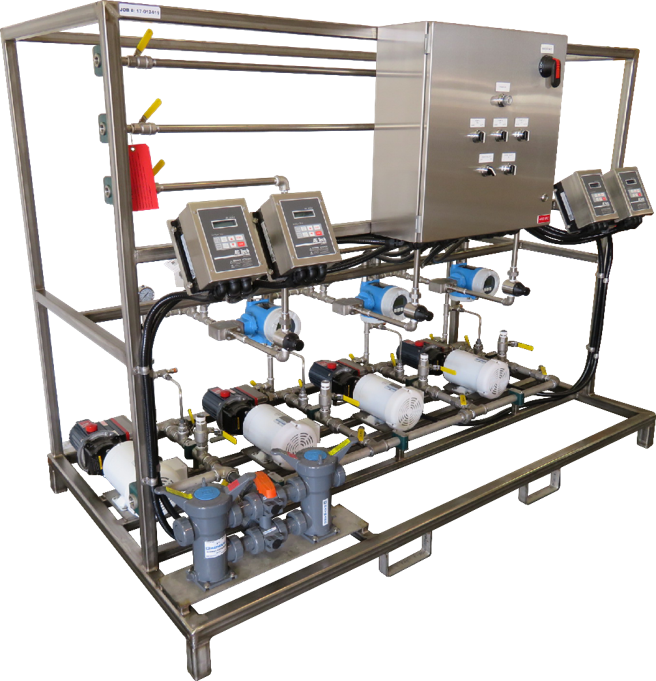 Accessorizing these units with flush routines, filtration, and pipeline accessories such as pulsation dampeners and back pressure valves is analyzed and advised by EGM process experts on a case by case basis, helping to insure the systems perform to expectations.